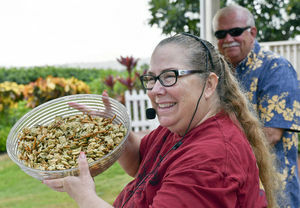 Laura Andersland of Salty Wahine shows off a bowl of freshly mixed Lilikoi Furikake party mix as her husband David looks on Wednesday during the Chef’s Demonstration at the Kauai Culinary Market at The Shops at Kukuiula. KUKUIULA — Laura Andersland of Salty Wahine Gourmet Hawaiian Salts unveiled four new party mix recipes during last week’s Chef’s Demonstration at the Kauai Culinary Market at The Shops at Kukuiula. The unveiling demonstrations offered shoppers at the Kauai Culinary Market an opportunity to sample the various recipes, including Lilikoi Furikake Snack Mix, the Salty Wahine Party Mix, the Salty Wahine Spiced Nuts, and the Salty Wahine Holiday Party Mix. Salty Wahine Gourmet Hawaiian Salts earned the two awards at the Ho‘okela 2016 annual conference of the Retail Merchants of Hawaii held Oct. 20 at the Hilton Hawaiian Village Waikiki Beach Resort, including the Fastest Growing Retail Business of the Year for which the Anderslands edged out finalists Crazy Shirts and Aloha Roofing Supply. En route to earning the Retail Business of the Year for Kauai, Salty Wahine edged out finalists Mahina, located in The Shops at Kukuiula, and Sueoka Store, located in downtown Koloa. Monkeypod Jam, with factory and showroom located in Lawai with Aletha Thomas, was another Kauai business represented at the 2016 Ho‘okela awards. The jam company was a finalist for Best New Retail Business of the Year. The Ho‘okela Awards is presented by the Retail Merchants of Hawaii whose mission is to promote the welfare of the retail industry, provide information and training, advance the interest of the retail industry, and serve as an advocate for the retail industry in both the government and business community. Salty Wahine will be conducting a chef demo at the market today at 5pm.